This story began in Berlin in 2011. At that time I, Anton Singariev, worked as a sportswear salesman. Warm summer days I spent on our balcony. From there I spotted this endless line for the first time. Since then I watched everyday as people wait in line for half an hour, and asked myself always the same question - what they're waiting for? Two weeks later my curiosity moved me to visit that cafe after my working day. 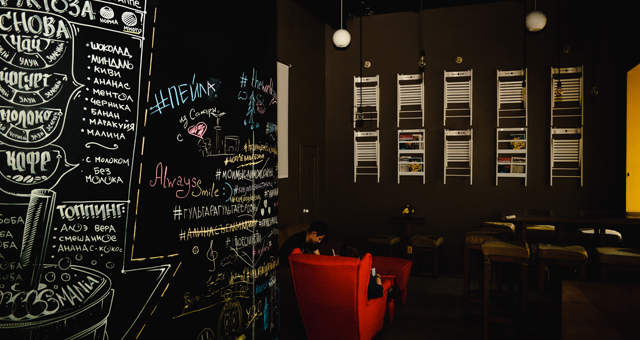 I remember clearly that moment when I stepped into the cafe. I was welcomed in an unknown language, it was strange. I went to the bar and asked a nice Asian young woman what do all these people here for. Not answering to my question she pointed at two cups: a big and a small one. I chose the bigger one. 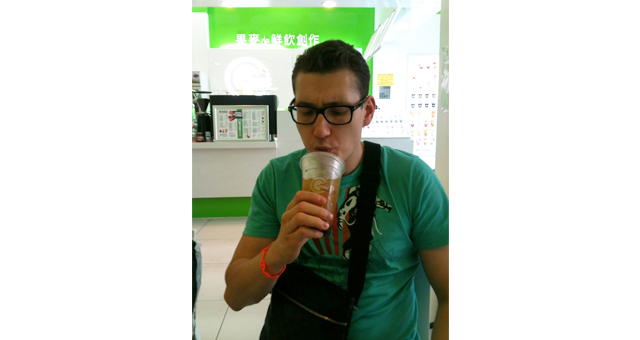 My first bubble tea was based on green tea with mango and tapioca bubbles. I instantly fell in love with it! 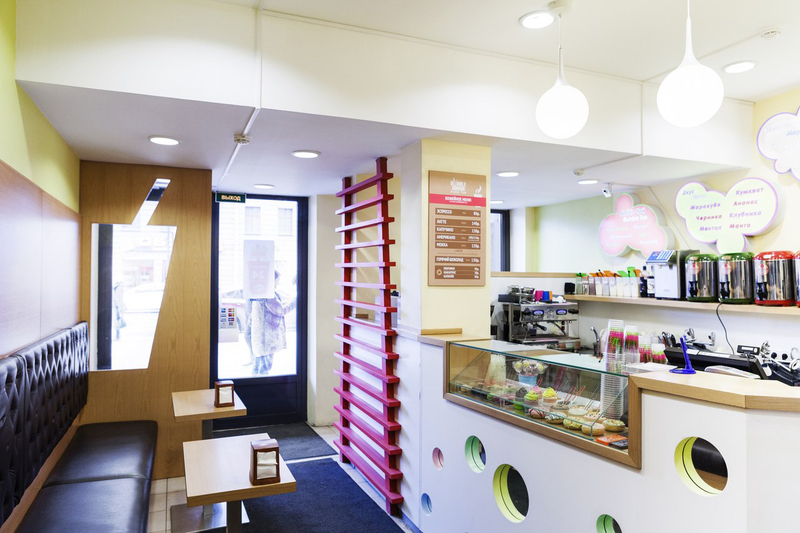 Since then I came there everyday and enjoyed unique flavor combinations of bubble tea. Because of my addiction my colleagues also wanted to try this amazing tea. 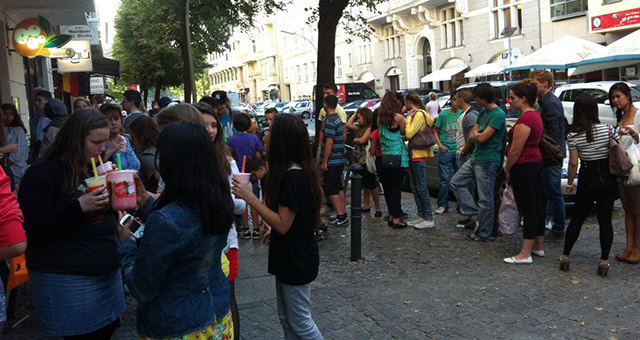 Not only great variety of tastes and unusual toppings attracted us, but also the way it was packed. Within the next few weeks most of my colleagues became “addicts” of bubble tea. I was so persistent talking about the drink to my friends, that they soon fell in love with it too. Watching people's positive reaction I started to think of opening my own tea station. My desire was very strong but I had questions too. How to begin? What is the first step? Where to get initial investment? What will be the name? Who are the suppliers? A lot of different questions came in mind, and for some time I couldn't answer them. Firstly, I started to search for companies which actively promote bubble tea on the market. To that moment there were only three or four companies, and two of them had offices in Berlin. Within a week I visited them. Unfortunately, they were not interested in selling me ingredients. 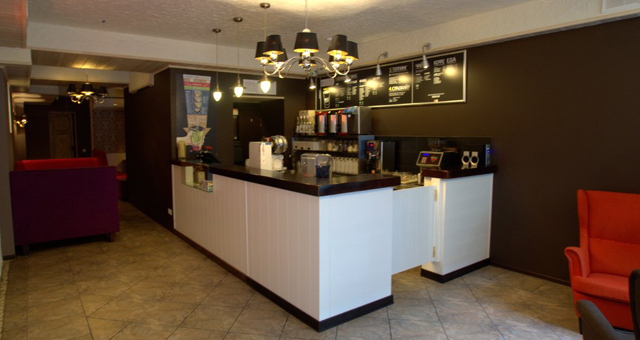 The only possible way was to buy a franchise and open a cafe under their brand. But the name wasn't attractive for me, their design and advertising weren't appealing. So I rejected the idea to buy a franchise. Two months passed, and I was still searching for my answers. During this period nearly 40 bubble tea outlets were opened and I decided that I lost my chance. Everything changed in late June 2011, when my mom called me. In her small women's clothing boutique she met a girl whose brother lived in Taiwan. At that moment he visited her in Berlin. So that girl gave my mother his phone number. I called him the next day and we agreed on meeting at Potsdamer Platz. Funny that we met in one of the most popular coffee shops in the world. I am sure that many of you know what I mean. Tomas appeared to be a lively and interesting person. He told me about life in Taiwan. He worked for a long time as a TV presenter on Taiwanese television, but also was really interested to try himself in business. After couple hours of discussion we agreed that I will visit him in Taiwan in a month or two. By that time Tomas should organize important meeting with suppliers of ingredients and equipment for preparing bubble tea. 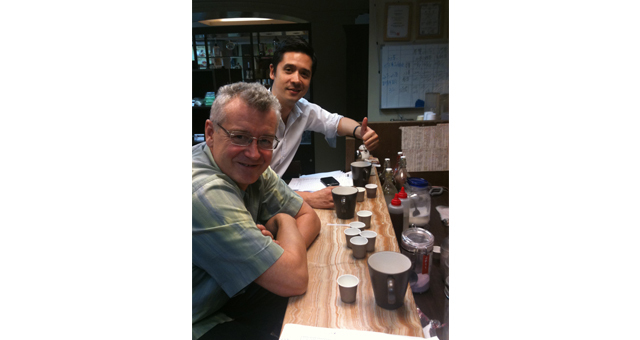 Also my visit included training in making bubble tea with one of the most experienced and respected masters in Taiwan. Of course, Tomas' assistance wasn't for free and I paid him certain amount of money. Inspired by our meeting I started actively searching for money to pay my trip expenses and services of Tomas. At first it seemed nearly impossible. However, luck was on my side. 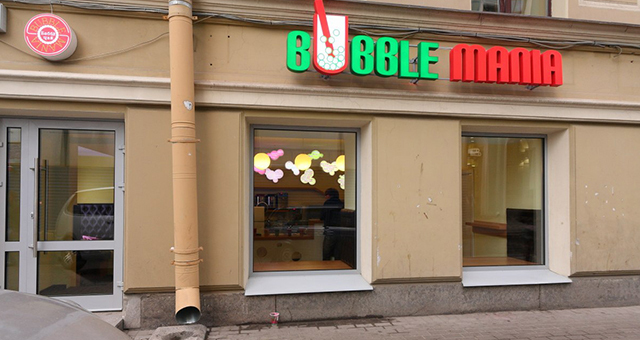 Then my father who lived in Saint-Petersburg called me, and I shared my idea on selling bubble tea with him. He laughed at me and said that I'm 20 years late, and tea market is already full. I explained that it is more than just a simple tea. We started to argue, I was telling about specialty and advantages of bubble tea. Finally, father believed in my idea and agreed to help me in receiving a bank loan by becoming my partner and co-founder of our future joint company. It was a common consumer credit and percent was high, but this money gave us opportunity to move forward. 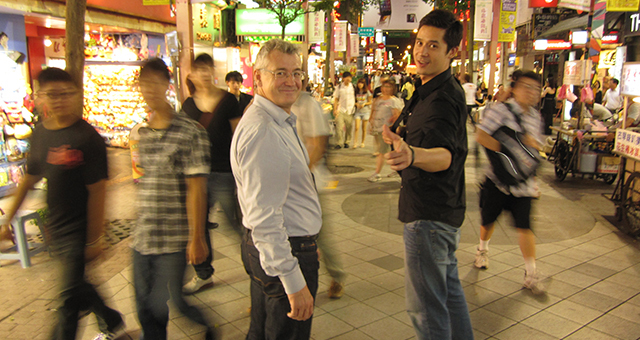 In September 2011 we traveled together to Taiwan. After a 12-hour flight we landed in Taipeh. 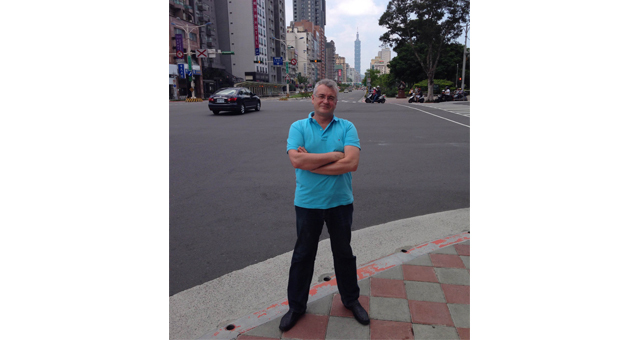 Tomas greeted us and led us to the hotel near the famous tower TAIPEI 101. Next few days were the most exhausting and at the same time the most memorable in my life. 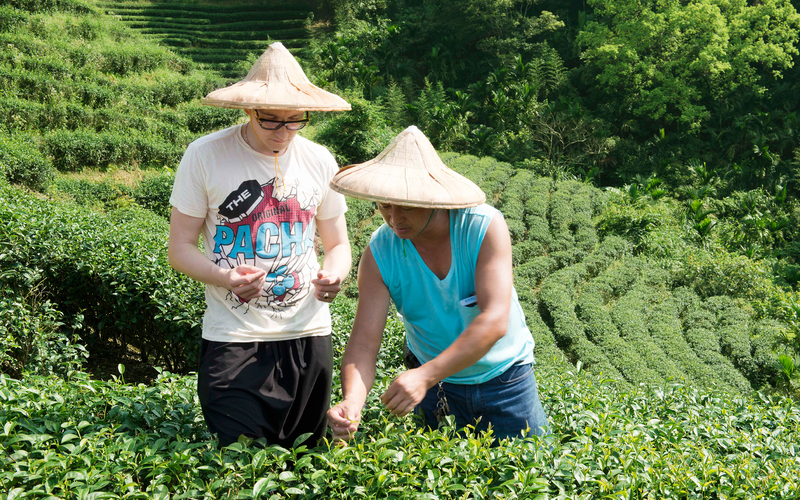 First week we spent searching for companies producing ingredients for high quality tea drinks. From the beginning I relied on the quality of drinks knowing that it is important for our future clients. Besides, high quality of goods is a key factor in the future competition. Original tea cocktails with rich outstanding taste will make us noticeable among many others. 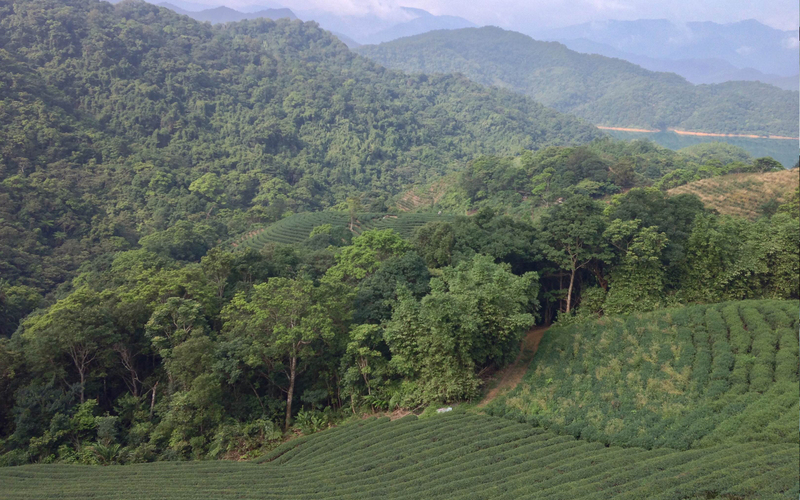 In the central area of Nantou county we found a company supplying 100% fresh tea all over the world. They grow a variety of tea, so we chose black Assam, green Jasmine tea and smoke Oolong. In Taichung we visited a manufacture producing legendary popping boba with different flavors. After our visit and topping testing we signed a contract on direct supplies. In Taichung we also found another strong partner – company launched in 1986 and produced syrups for bubble tea. At that moment company supplied thousands bubble tea outlets in Asia, Australia and America. But not only this fact made my decision. We managed to agree that they will produce syrups especially for us and develop new tastes. It was essential because Taiwanese people used to extremely sweet flavors that Europeans aren't keen of. In Taipeh we found company producing professional equipment for making bubble tea. Then we had to find talented designer who could create a project of our future tea station. Tomas introduced us to Onion – young gifted original-looking artist. Our decision to look for a Taiwanese designer wasn't accidental. I remember that many aspects of working process on tea station were very unfamiliar to me. It required training on Taiwan and consulting advises from specialists so this field stop being a mystery to me. So I couldn't imagine how designer who never saw a tea station can correctly make a draft of bar counter and worktop. For Onion it was easy. If it was necessary, he just stepped outside and made a visit to the nearest bubble tea cafes to check everything. While making a draft of bar counter we had to make an important decision. 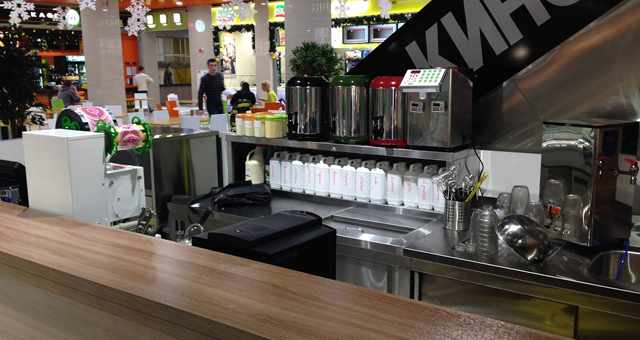 The bar equipment had to be installed that way, so process of making bubble tea will be as fast as it can be. Within a month of our joint work Onion sent us the final version of the working space of our future tea selling point. 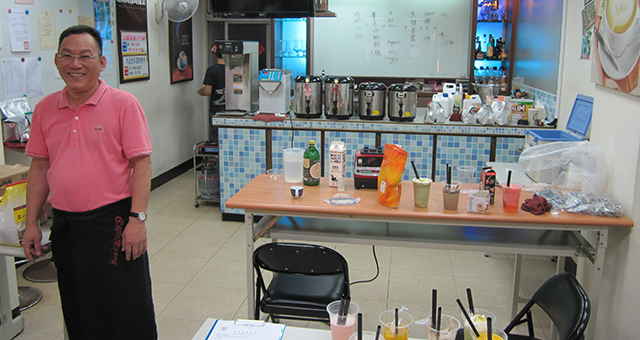 Now we were ready to learn from the most popular and successful bubble tea master in Taiwan – Mr. Chang. He told us that he is in this business for more than 20 years. He already opened several shops selling ingredients for bubble tea, and schools where anyone can learn how to professionally make this traditional drink, and arranged a publishing of catalog. Mr Chang participated in TV shows and was an acknowledged leader in his sphere. We spoke to Mr Chang with Tomas' help. We spent two weeks learning all details of preparing the legendary drink. We found out how to properly cook tapioca, brew tea and mix various ingredients in correct proportions. Due to the knowledge we created original process charts for BUBBLE MANIA. After talking with different bubble tea suppliers we decided that German market was already occupied with tea outlets of different brands and types. 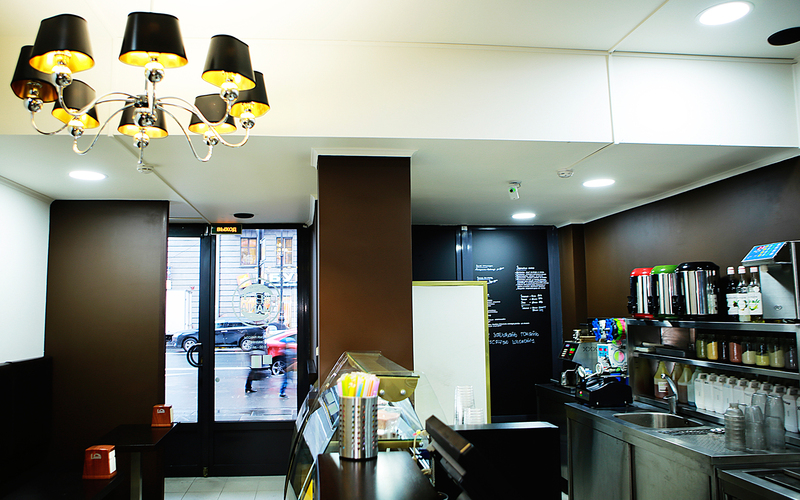 Then came an idea of launching our business in Saint-Petersburg. So, spending three weeks on the island of Taiwan we got back to Berlin. I returned to my previous job to fulfill the contract. And while I was at work my mind was full with plans on future business. While working with clients I was creating the name of the first branch store. I juggled with different titles very long, several times even conducted opinion polls among relatives and co-workers. Finally, I settled with BUBBLE MANIA. Why so? The answer is simple. Bubble tea exists for 30 years. Appearing in R.O.C., in Taiwan, this drink became very popular in Asia, America,Australia and even Europe. 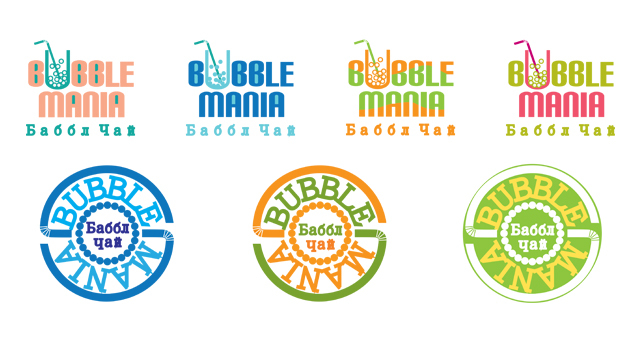 The name of BUBBLE MANIA reflected growing interest and keenness to the new and unusual drink. In the beginning of November 2011 I quit my old job and bought a one-way ticket to Saint-Petersburg. I arrived to the city with only one suitcase and big dreams ahead of me. The first half of year was quite difficult for me as I had to arrange a lot of practical issues. 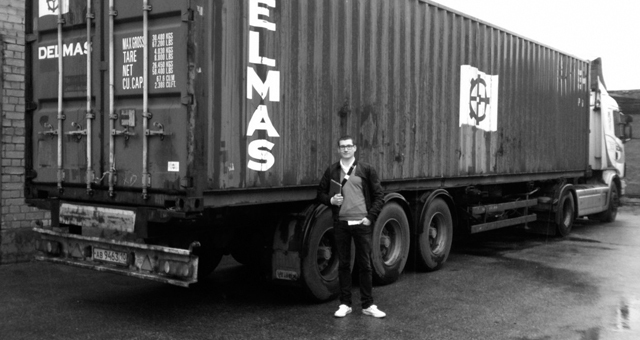 Organizing of shipment of the first container with all ingredients took the first place in my thoughts. 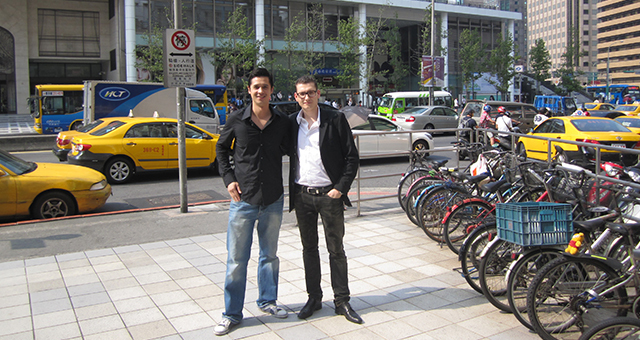 Our Taiwanese partners didn't speak English so we asked Tomas for his assistance again. At that moment I felt happy that we met. With Tomas' help we listed our first order of ingredients. However, I had no experience in supply planning. The practice showed that I ordered not enough toppings. Another big step was to find the right space. I didn't know where to open the first BUBBLEMANIA outlet. Which space will be optimal and what kind of rent rate should be for a quick return on investments? Unexpectedly I received help from Evgeny Chichvarkin. I saw his interview from 2011 when he told about missed opportunity to open Euroset in GUM. In 1998 GUM offered him to rent a space for 8000 USD. He refused as was sure that couldn't manage with such fast company growing. At the end ION company took that space and rapidly expanded by the favorable placement. “The conclusion: it is better to sorrow if you did something than if you did not”. In April I received a call from my friend Marina who offered me a matching place on the corner of Nevsky ave., 11 and Kirpichniy str., 2. My father enabled me to make this important decision. I immediately decided to take that place no matter how high the rental rate is (nearly 700.000 RUR per month) as opening in historic part of the city could easily attract locals and tourists. The next day we signed the contract and began to renovate. This totally right decision was the first step in our success. The first BUBBLEMANIA warmly welcomed our clients on May 23rd, 2012. After 7 working days we were selling more than 300 cups of bubble tea per day, and all investments were repaid after 3,5 months. Looking back I am glad that chose and made this difficult path to achieve my goal. Yes, it was hard, I didn't sleep at night, lost 10 kg and couples of years of my live, but this amazing experience made me better and tought me a lot. All these unfamiliar feelings totally worth it!